The highlight of my weekend was watching a 200-strong crowd shout in unison: Poverty is Sexist. 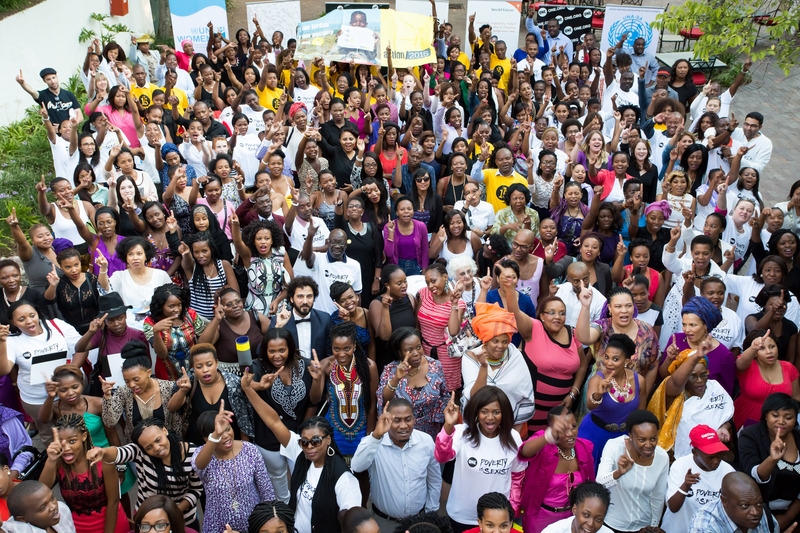 We were gathered on International Women’s Day to launch ONE’s new campaign in the presence of government and UN officials, action/2015 partners, celebrities, the media and over 200 ONE supporters at Indaba Conference Centre in Johannesburg. 2015 is indeed an important year. Global leaders will negotiate and agree to a set of Sustainable Development Goals (SDGs) meant to end extreme poverty by 2030. The African Union (AU) in its effort to refocus the world’s attention to issues of gender inequality has also named 2015 the AU Year of Women Empowerment and Development. Our leaders have a once-in-a-lifetime opportunity to set a new development path that can help overcome extreme poverty in a generation. The current 17 proposed goals span all facets of development, from energy access to hunger to peaceful and inclusive societies, and will be underpinned by specific, numeric targets against which the global community can measure progress. While we work to ensure that these goals and targets are good enough, we also have to ensure that they are famous enough so that people know what they are, and can hold their leaders accountable for their delivery. Ending extreme poverty is no longer a pipedream. Time and time again, mankind has demonstrated how innovation, resilience, willpower, science and technology can help us overcome complex challenges and forge ahead with new astounding accomplishments everyday. That is why I consider it insane that in this age of complex technological innovations and development, so many people can still go to bed hungry. We certainly have the means, the knowhow and the resources to end that in our lifetime! Now we need the political will and commitment of the world’s leaders nudged along by all of us whose job it is to fight for the end of extreme poverty, preventable disease and ignorance in the world. That is why this year’s two significant multi-lateral processes (the Global Post-2015 and AU Year of Women Empowerment) are not only important on their own, but also complementary to each other in presenting an opportunity to address and redress in significant ways perhaps the biggest factor – gender inequality – when it comes to holding back human advancement everywhere. International Women’s Day presented a good opportunity to remind ourselves that gender equality doesn’t only right social injustices, it also makes economic sense. What an appropriate day to kick off the Poverty is Sexist campaign, which we hope to take into several African countries over the next few months, with a series of pubic engagement, lobbying and advocacy activities. Globally, almost half of women’s productive potential is unutilized, compared to just 22% of men’s. What’s more, a 2008 ILO analysis of 83 countries shows that women in paid work earn on average between 10-30% less than men. Cultural and legal limitations create these disparities, despite the fact that in developing countries, and beyond, women provide the backbone of many aspects of life: in the home, at work and in the community. In sub-Saharan Africa, 50% of the agriculture labour force is female, who, together with their male counterparts, produce 80% of the continent’s food. African women also play a critical role in the continent’s health sector as healthcare providers and primary caregivers looking after sick family members. Some challenges that are peculiar to women also need to be addressed with more resolve. For example, properly nourished pregnant and breastfeeding women could help prevent 800,000 neonatal deaths to undernourished mothers. What we now know based on a number of studies is that we cannot overcome extreme poverty without advancing gender equality. That is why we say that poverty is sexist. We at ONE are therefore, in line with the African Unions Year of Women’s Empowerment and Development, focusing our attention this year on women’s and girls empowerment and working to ensure that the post-2015 processes as they shape the new development agenda, do so through the lens of women and girls. In Africa, ONE will be specifically campaigning to ensure that the Post-2015 Sustainable development goals properly take into account the needs of women and girls. • Focused attention across the agriculture value chain, commitments to deliver extension services to women and to advance equal land tenure rights, access to credit, labour and inputs for women by breaking through legal and cultural challenges; as well as delivery of Malabo commitments. • Attention to maternal mortality goals and Prevention of Mother to Child Transmission (PMTCT), in addition to strengthening health systems to prevent crises like Ebola from re-occurring. • Increased domestic investments in women and girls, ensuring that all budgeting, particularly in education, health and other social services, the use of internal revenue (including extractives revenues) and planning processes are carried out with due regard to the principles of transparency and accountability and that they are gender-responsive. The work that needs to be accomplished goes way beyond these few areas that we have chosen to focus on to compliment and contribute to the regional efforts by other bodies such as the Gender is My Agenda Campaign (GIMAC). The Africa Rising narrative which has had so much currency in recent times, while so powerful will only bear fruit if Africa puts to best use all of its resources to drive its own development. Only then will the support and efforts of its development partners have the desired impact and complimentary multiplier effect that is expected. But transparency and accountability are key to ensuring that these resources – domestic and external – are put to fair and proper use, even, and especially, as we focus on women’s empowerment and development in 2015! Join the campaign: Tell African leaders to take action that leads to real change for girls and women.